Times are hard for democracy. Trump wants a wall. Senators refuse to question judicial nominees. And anti-Hillary liberals seriously contend that she is “as bad as” the opposing party’s presumptive nominee, vowing not to vote if she wins the nomination. But when were they ever otherwise than hard? Democracy has always been vulnerable to extreme opinions and dogmatic certainties. Sometimes the price of free speech is listening to things you don’t want to hear. Theater holds a possible remedy, though, to some of our worst tendencies. It’s pretty simple. We need more tragedy. Of course, tragedy might seem remote and irrelevant. To many it is dimly remembered as something to do with hubris, catharsis, and tragic flaws. We hear the word tragedy in the news mainly when it’s misapplied to some disaster, natural or otherwise. But it needn’t be either irrelevant or misappropriated. Tragedy is not just the stuff of English tests. It has a long and illustrious history as a salve for self-government. No coincidence that democracy and tragedy arose around the same time in ancient Athens. While scholars disagree about exactly how tragedy arose, we are certain that it evolved alongside Athenian democracy. Athenians understood that what they saw onstage taught them truths and ways of thinking vital for their roles as citizens. Like the law courts, tragedy was a civic institution. Funded by the state, it was perhaps the greatest citizenship class ever. The most important tragic lessons warn against extremism. Tragedy centers on heroes who, paradoxically, are passionate to do precisely what the gods decree. They are men and women who invite their fate with extreme self-regard combined with all-or-nothing thinking. Consider Oedipus the tyrant, eponymous hero of Sophocles’ most famous tragedy. Witnessing a plague ravage his home city of Thebes, Oedipus boasts that he, “whom all men call the great,” is the only person who can save the day. Sound familiar? “I am the only one who can fix this,” tweeted Donald Trump last month. He was stumping on the loss of American jobs to Mexico, but it’s an attitude he uses throughout his political performance. And tragedy offers its comeuppance. The plague in Thebes is caused by the unsolved murder of the previous king of Thebes, Oedipus’ father—who was slain by his only son. That is the very definition of tragic irony. Admittedly less tragic but no less ironic is the fact that, tweets to the contrary, Trump has been accused of outsourcing jobs to foreign employers. No one is the “only one” to fix anything, tragedy tells us. In fact, thinking that way is a trait of those who cause problems. A related insight comes from Oedipus’ own headstrong daughter, Antigone. In her eponymous tragedy, having apparently learned nothing from her father’s example, Antigone is certain that she alone knows what piety is and what the gods want—the burial of her rebel brother. But self-righteousness runs in the family, on both sides. Antigone’s maternal uncle Creon, current ruler of Thebes, is just as adamant that he knows best. The gods do not honor traitors, he asserts, punctuating his assertion by burying his niece alive. 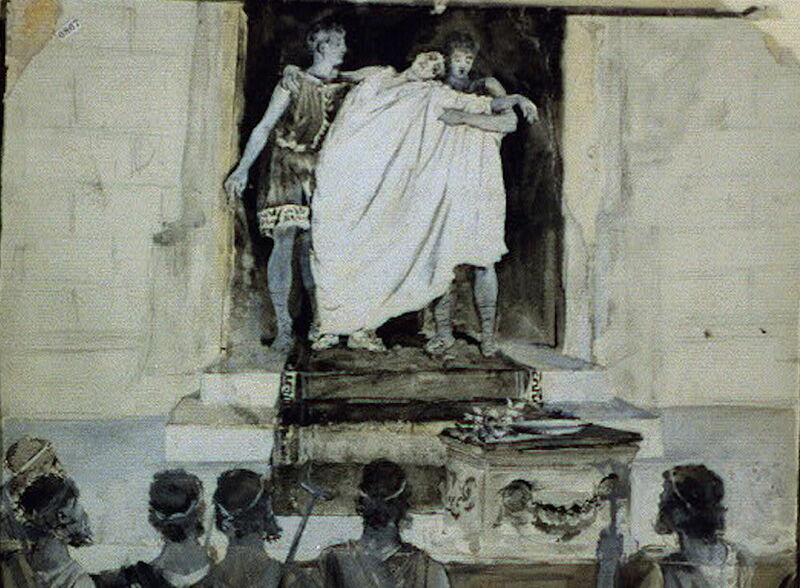 Antigone, always swift to stress her independence, even in the choice of death, ends her own life by hanging before she can serve out Creon’s sentence. As Hegel almost said once, tragic heroes have one-line bucket lists. Once that item is crossed off, you can cross off the hero as well. Such single-minded, black-and-white thinking dominates politics today. Pundits, politicians, and private individuals alike love to make noise about the doom that will overtake us if we even consider the opinions of their opponents. Overlooking his misuse of the term, there is nonetheless something tragic in the French Prime Minister Manuel Vall’s recent prediction that a U.K. “Brexit” would spell “tragedy” for Britain. But despite the Delphic injunction to “know thyself,” we never quite succeed. Even the brightest light, when shone against the self, casts a shadow. Oedipus may be able to solve the Sphinx’s riddle, but he must also recognize that he himself is a riddle that defies reason—his children’s brother, his mother’s husband, his father’s slayer, his city’s savior and its destroyer. The consequences of this forced recognition are horrific: He loses his sight, his homeland, and his wife and mother at one fell swoop. Such consequences are not restricted to tragic heroes. Politicians are by custom if not by nature in the business of projecting false images of themselves. And then, when we find out the “truth,” that they are not really what they seem, we are horrified, ashamed, and feel betrayed. Richard Nixon swore he was not a crook. The White House tapes proved otherwise. John Edwards seemed a model of sympathy. The handling of his extramarital affair tells another story. Smack dab in the middle of a speech in the middle of Antigone a character called Haemon advocates this middle-of-the-road approach to life. “Don’t think that you alone know the truth and everyone else is wrong. Such individuals, when they are opened up, are found to be hollow inside.” Unfortunately, it is often such “hollow men” who seem to make the biggest noise and to have the greatest courage of their convictions. But sometimes these people are heard above the rest simply because they are empty inside. Their souls are echo chambers, amplifying pin drops to thunder claps. Tragedy diagnoses this hollowness—and listens for the softer voice of sophrosyne that might better guide our governments and our lives. Tragedy challenged Athenian citizens to question their own black-and-white thinking, to open their minds to the perspectives of others. This is not to say that ancient Athens was perfect. Far from it. It was rife with xenophobes, demagogues, and warmongers. It was propped up by slave labor. Its women residents not only did not have the right to vote, they were almost certainly dissuaded from attending those very tragedies that extolled democracy. It was a culture with a lot of work to do. But so is ours. Which is why we can’t afford to discard the millennia-old art form that can help us address very contemporary problems. Athens needed tragedy. We do, too. Daniel H. Foster is a Senior Lecturer in Literature, Drama, and Creative Writing at the University of East Anglia. He is the author of Wagner’s Ring Cycle and the Greeks (Cambridge 2010) and is currently at work on The Minstrel’s Progress: British Bards to American Blackface, 1750-1850. Primary Editor: Siobhan Phillips. Secondary Editor: Sara Catania. *Image by Alfred Brennan, courtesy Library of Congress.